"Based on how northern indigenous people understand animals in historic times," Losey tells Discovery News, "I think the people burying this particular dog saw it as a thinking, social being, perhaps on par with humans in many ways." Most of us in the animal protection world don't like the idea of people dressing up their dogs. Fashion critic Mr. Blackwell, who, for 47 years, wrote the annual Worst-Dressed Celebrities list, was appalled by the idea of people dressing up their pets. Then again, we humans were putting jewelry on our dogs at least 9,000 years ago. A new study explores the relationship between humans and dogs, examining ancient dog skeletons in Siberia. One of the dogs buried with his person is wearing a necklace made out of red deer tooth pendants – a fashion trend among humans of the region at that time. Lead author Robert Losey says that the typical dog guardian had spiritual beliefs and wore jewelry that sometimes wound up on the dog. He adds that his study lays to rest the idea that dogs back then were just work animals who were brought along on hunting trips. That's in part because the people in the region that he was studying ate mostly fish, not land animals. Siberia has been known for some time as a place where dogs were buried with their humans. And while most of the remains come from a time around 10,000 years ago, a 2011 study shows one remains of a domesticated dog that dates back 33,000 years. The dog in this photo was carefully laid to rest lying on his right side in a grave pit that also contained five humans. Losey says that according to his analysis, the dog ate the same food as the humans: fish, freshwater seal meat, deer, small mammals, and some plant foods. But he was no couch potato. 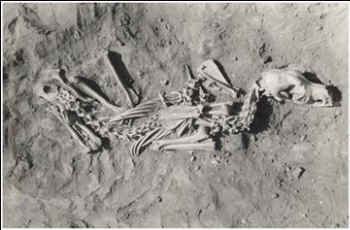 The dog's skeleton, particularly its vertebrate spines, suggests that it was repeatedly used to transport loads. This could have included carrying gear on its back that was used in daily activities like hunting, fishing, and gathering plant foods and firewood. The dog also could have been used to transport gear for the purposes of relocating settlements on a seasonal basis. 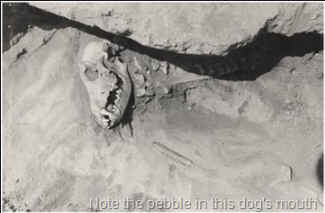 The scientists also examined a wolf from the same area – one who had apparently had no particular contact with humans. His/her remains were found wrapped around a human skull. Perhaps the burial of the wolf with the human head placed between its feet was done to send the spirit or soul of the wolf with this particular human to the afterlife, perhaps as its protector. I think the hunter-gatherers here saw some of their dogs as being nearly the same as themselves, even at a spiritual level. At this time, dogs were the only animals living closely with humans, and they were likely known at an individual level, far more so than any other animal people encountered. People came to know them as unique, special individuals. One man was buried with two dogs, carefully placed on either side of him. Another dog was buried with a round pebble in her mouth. And others were buried with spoons, stone knives and other objects.